By Adam Rizvi, additional writing by Dr. Shirin Abbas: WASHINGTON, DC, Nov 13: Strings of lights and colorful ‘Rangoli’ designs bedecked with flower petals ushered enthusiastic guests to the official Diwali function at the Indian Chancery in Washington DC on Sunday. 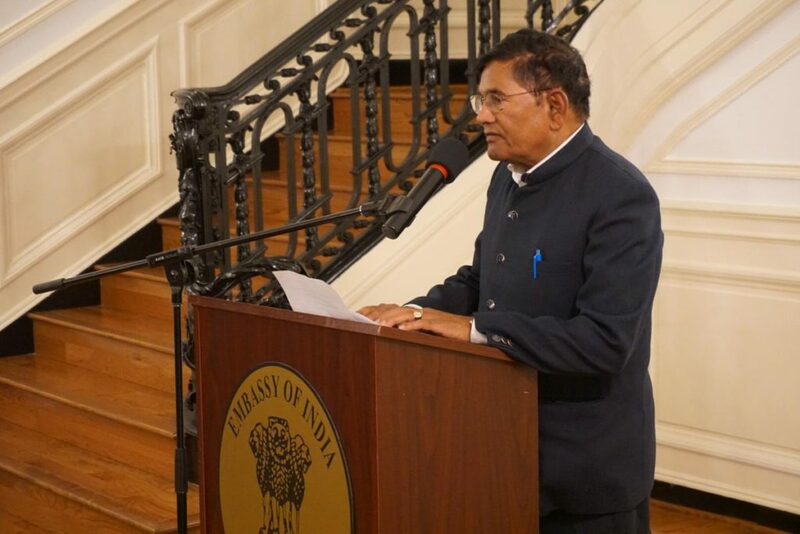 It was a jam-packed main hall of the Indian Chancery hall welcomed guests for the official Diwali celebrations held at the US capital by the Indian Consulate on Sunday evening. 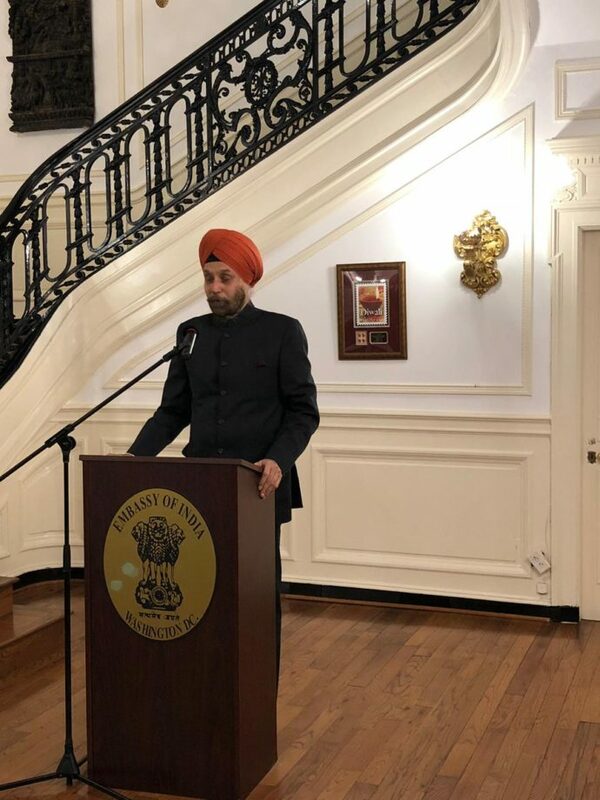 Welcoming the guests, the Indian Ambassador Navtej Sarna proudly stated that that the “festival of Diwali has become emblematic of India abroad” and gave credit to the Indian diaspora for making it the best known Indian festivals in America. Mr. Sarna revealed that US officials reacted positively to a suggestion by the Indian Embassy to co-host the Diwali event at the US State Department earlier this month. He said more similar celebrations would be held in other official mansions of the US. 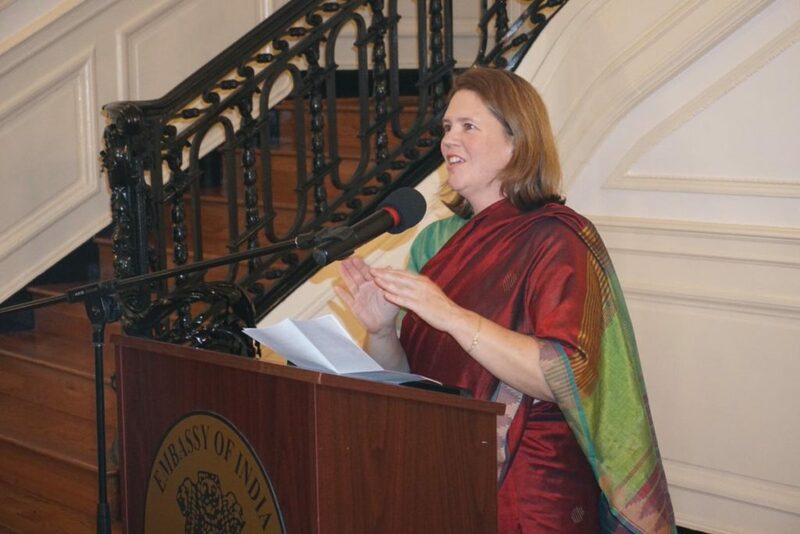 Over 200 people had attended the joint Indo-US Diwali function. which draws several influential lawmakers — all staunch supporters of India and loyal friends of Indian-Americans. “It is that light of higher knowledge which dispels all ignorance,” noted Srimati Karuna, director of the Gandhi Memorial Center since 2006, ( Bethesda, Maryland), who spoke about the significance of Diwali emphasizing its importance as a festival of lights. “The observance of Diwali each year is not only a time of festive celebration but a sublime reminder that light is the source of life,” she said in her address. “We know that Diwali is a festival celebrated worldwide by Hindus, Sikhs, Jains, Buddhists, but the symbol of light is universal. All of humanity knows not just the meaning, but the reality of light. We live in a universe of light and that light lives within us,” Srimati Karuna told the gathering. “Diwali also marks a time of reflection on that inner light of all beings that illuminates our vision with greater understanding, greater hope, and greater wisdom and the essence of the festival was to enlighten our minds and hearts with goodness, beauty, and truth”, she averred. Each year the Indian Embassy attracts the finest talent to present their skills before an enraptured audience and this year was no different. The very talented singer Krishnapriya, associated with the Chinmaya Mission in Frederick, Maryland, enthralled the audience with semi-classical, devotional and folk songs. 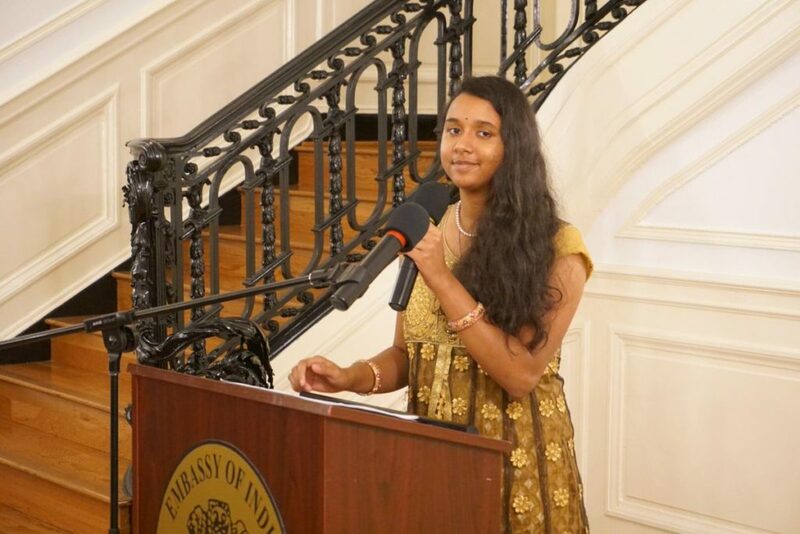 At present Krishnapriya is a freshman at the University of Maryland with a major in international relations. She has been an ardent lover of music since childhood and is a trained Carnatic music singer. Her guru is Sri Padmanabhan based in California. The vote of thanks was delivered on the occasion by Dr. Satish Misra, president of United Hindu and Jain Temples (UHJT) of the Washington metropolitan area, a consortium of 14 major houses of worship.